During the Fridays of Lent, Christians throughout the world gather and participate in the Way of the Cross. This practice involves retracing Jesus&apos; footsteps on the road to Calvary, allowing the faithful time to meditate on the journey Jesus made on his way to his death for each of us. Back at our church in College Station (and in most churches in the USA), the Way of the Cross is walked within the church building itself. However, Nicaraguans love to walk in procession! 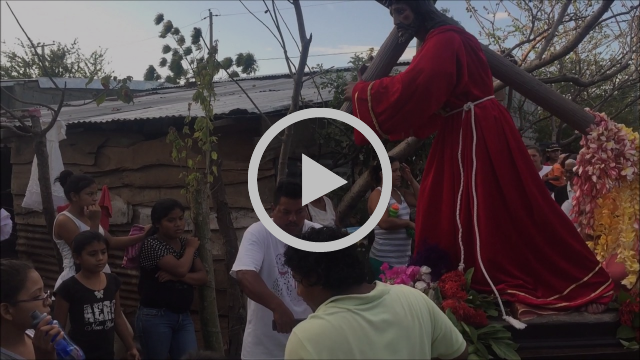 They gather in their neighborhoods and walk a heavy statue of Jesus the Nazarene through the streets, stopping to pray at various houses along the way, accompanied by a small band. It is a beautiful tradition and a way of sharing their faith with the community. Neighbors hand out bagged drinks to those in the procession, helping to combat the afternoon heat near the equator. After completing the Way of the Cross, hundreds gathered in the street in front of a small convenience store to celebrate an open air Mass. Quite an experience! Click the video above to get a sense of the procession! We recently were asked to help with a project for inmates within the Nicaraguan state prison located outside of Granada. The prisons are dirty, overcrowded and lack resources. Inmates rely on family members, churches and aid groups to provide even the basic necessities - adequate food, toilet paper, soap, clothing, etc. Nothing to speak of is provided by the prison, so often the inmates go without. As part of a mercy outreach project, Ben, Rachel, and Rebecca helped assemble care packages that included things like rice, cereal, basic toiletries and clothing. 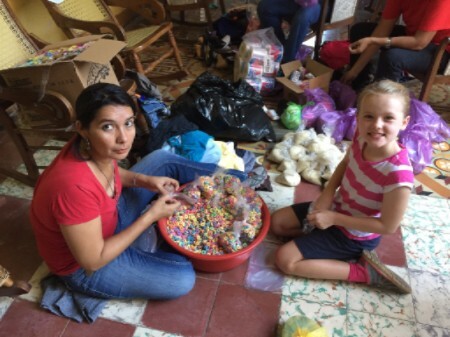 The kids had a blast with the project, with their favorite part being packaging up Fruit Loops! Sometimes we have the opportunity to sit in on meetings in the various communities where the local people discuss problems and propose their own creative solutions. At a recent meeting, the locals were concerned they would not have money for food to serve their guests at a church festival six months from now, and this would be a source of embarrassment. 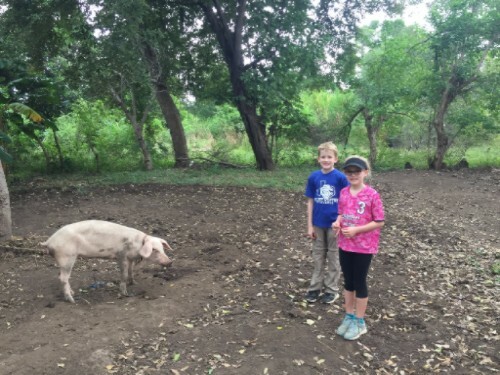 Our friend, Doña Patrona, suggested that 10 people each chip in 100 córdobas (US $3.00) to buy one baby pig, and one other person volunteer to keep and care for the pig. While it is at times tempting to step in during these discussions and simply cover the cost of something as basic as a $30 pig, we also understand that this would rob the community of the sense of pride that they will have as they serve their guests on the day of the festival. Please pray for wisdom as we face these situations, balancing relief, development and relationship building. 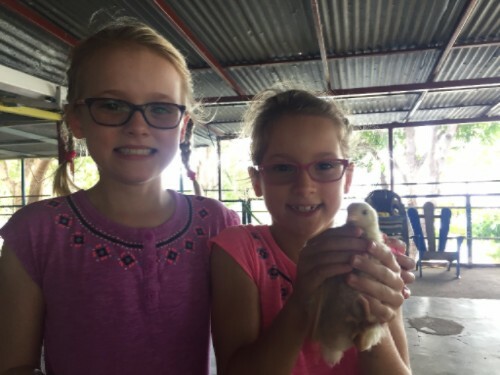 In the photos above, our kids visit another pig (whose fate is also sealed) and enjoy holding a baby chick! How are donations to Camp Esperanza being spent? Recently, a few folks have asked us this question, so we thought it was best to answer it within a newsletter for everyone. First of all, we would like to share how donated funds are NOT spent. No money received goes towards personal support, living expenses or administrative costs. 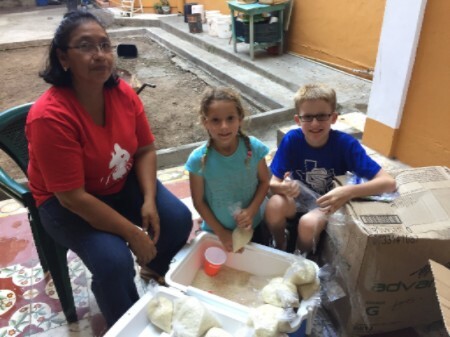 While many missionaries rightfully need to raise money for these purposes, we are blessed that the Archdiocese of New Orleans provides us with a monthly stipend and covers a missionary medical insurance policy for us as well. The rental of our College Station home offsets the cost of our monthly housing rental expense in Granada. In addition, we have a couple of benefactors that cover all ongoing administrative and transportation expenses - postage, gas, vehicle maintenance & insurance, etc. Donors are always free to designate funds as they desire. While we are Catholic Christians, we are proud of our ecumenical base of supporters. We respect that some of you do not share the same faith and are careful to use funds according to the wishes of our donors. Some prefer that their gifts are not used for anything expressly religious, while other prefer that their gifts be used for religious purposes - we respect both positions. Above all, we thank you for your interest in our mission, your prayers and the trust you place in us. 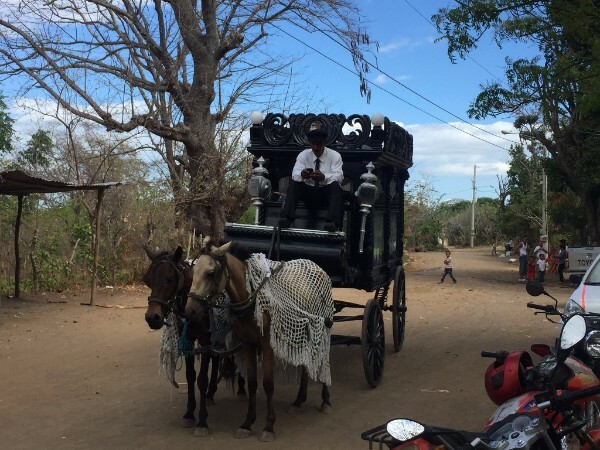 Granada still uses horse-drawn hearses for bringing the deceased to their final resting place. As Pat conducts a funeral service inside a home in the Posintepe neighborhood, the chauffeur checks his mobile device - proof that cell phones are everywhere these days! "One day two cows jumped over the fence and into our school. One was brown and one was white. The white one had horns, so luckily the white one was not mean. But, the brown cow went into the garden and was acting crazy. Professor Marlon, one of the teachers, went into the garden and threw grass at the brown cow. He was worried the cow would destroy our Yuca, which is a vegetable, sort of like a potato, that people eat here. The brown cow did not like grass being thrown at it, so it came running out and almost ran over Sharon and Javier, our friends. Then, the kindergarten kids came out and Rachel had to grab the principal’s kid because Rachel was afraid the cow would run over him. The person who takes care of the cows didn’t come get his cows, so the police came. One was in a black uniform and one in a blue uniform. But the man who takes care of the cows finally came and took the cows home. But first he got a lecture from the police. But the cows help our garden too. We gather the cow poop and use it as fertilizer. We use shovels to pick it up, but the kindergarten kids use their hands!" Interested in seeing our work firsthand? Consider joining an upcoming medical mission trip! One of our greatest needs is for dentists able to see patients in the more remote communities. Due to the lack of reliable treated municipal water and fluoride toothpaste, many outside the city suffer from tooth decay. All other medical professionals are also in need, especially primary care physicians. 1. June 25- July 2. This medical mission will be coming from College Station and serving the many small communities of St. Teresa of Calcutta Church in Nandaime. This team is in search of dentists and physicians! Kathy Polzer from St. Thomas Aquinas Church is leading this group. Please contact her at kpolzer@csisd.org or at (979) 777-4350 for more information. 2. July 22 - July 29. This mission is organized through the Christ the Healer Medical Mission. Please contact Kristie Vollentine at pof@archdiocese-no.org or at (504) 527-5774 for more information. 3. And please pray for the success and safety of the April 22-29 Christ the Healer mission team. We look forward to hosting them soon! May God continue to bless each of you!